Here’s some new offers from Microsoft Press in the market that your community can take advantage of! Feel free to share it with your community! We’re pleased to announce that two Microsoft Press books received an Award of Distinguished Technical Communication in this year’s STC International Summit Awards. The Society for Technical Communication describes the qualification of the award as "The entry contains no major flaws and few, if any, minor flaws. It applies the principles of technical communication in an outstanding way, particularly in the way that it anticipates and fulfills the needs of its audience." Use code NLMYSTC and get 50% off these ebooks. Offer expires May 16, 2013. If you’re attending TechEd 2013 in New Orleans, be sure to stop by the booth (#511). Our staff would love to meet you and answer any questions you may have about Microsoft Press books. We’ll have some great freebies for everyone who shows up. Greetings, developers. In case you missed it, take a look at this post by Lee Culver, a software developer on the .NET Runtime team, which introduces you to a new managed library that allows you to automate inspection tasks and access more debugging info. The post continues with an example and related code in three sections: "Getting Started," "Analyzing the Heap," and "ClrMD Features and Functionality." Corporate Data Loss has become a major issue for almost every company. If a company has not suffered from Data Loss, either through an external malicious attack, employee error, or even worse employee deliberate action; most are very aware of consequences of a Data Loss. These consequences include such things as fines, lost trust from customers/clients, payment of credit monitoring services, and many other items that could severely impact a company’s bottom line or, worse, its future. Shelby and Larry from Microsoft Learning represented Microsoft at the "Joining Forces" event at the White House today, with First Lady Michelle Obama speaking at the event. The Joining Forces pilot program was created to put military personnel through IT training and get them certified with industry recognized certifications to prepare them to enter the workforce when they leave the military. Many Windows users these days have a Music Library on their hard drives containing perhaps thousands or tens of thousands of MP3 and WMA files. To play this music on the PC, generally such users run the Windows Media Player or the Windows 8 Music application. But for programmers, it’s good to know we can write our own programs to play these files. MCT Michael Bender shares 12 tried-and-true tips for test day, plus 6 practical steps for approaching each exam question, in his latest post on Born to Learn. In working with top tier app partners, the Windows Ecosystem Team has seen developers produce an app in a little as two weeks, whereas others meander around for months with little to show. Why this discrepancy? What are the factors that make the difference between struggle and success? In this webcast, Kraig Brockschmidt will share the experiences that he and his team has gained from working with these partners to help you get your productivity in high gear for your own app-building efforts. Check out our Webcast page for on-demand videos of past webcasts and more upcoming live events. 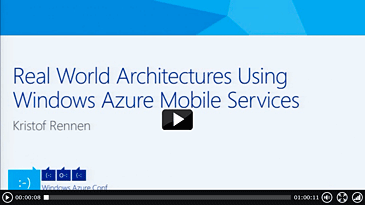 In this session we will show you how Windows Azure Mobile Services can already be applied in real world architectures and projects, even while it is still in preview. We will talk through a few Windows 8 and Windows Phone apps, already or soon available in the Windows Store and we will show you how to combine the SDK and REST possibilities offered by the service to build solid solutions on all mobile platforms. PS. Whether you’re just learning Windows Azure or you’ve already achieved success on the platform, numerous sessions are available and executed by the Windows Azure community members.